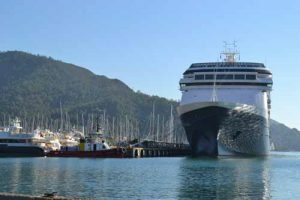 Our Marmaris cruise port guide gives you information about the docking location, cruise dock, transportation options and much more! 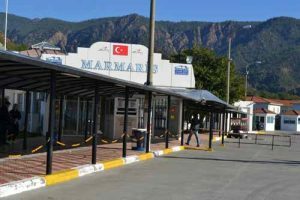 Welcome to the Marmaris cruise port guide. Marmaris is a small port town and mayor tourist destination on the Turkish Riviera. In the ’80 this sleepy fishing village transformed into a resort town in no time! Nowadays it is surrounded by beaches and hotels, but still its charming old town remains. From the cruise ship you will have an amazing view over the yacht harbour and the unique old fortification and castle of Marmaris. Visit the famous Marmaris castle, shop at the local bazaar (market) and explore the Marmaris old town. It’s all within walking distance of the cruise port. People looking to go further afield can go to fishing village Paradise Island, the white beaches of Cleopatra’s Island or the ancient cities of Caunos and Kinds. When your cruise ship is docked in port you will be able to see Marmaris old town on the small peninsula across the harbor. 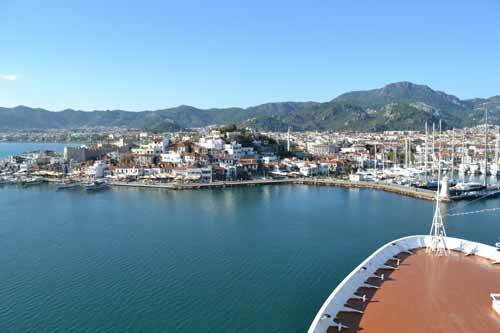 Find the Marmaris cruise terminal on the dock. Inside you will find several facilities like tourist information. Find a Sixt car rental service close by the cruise port. See its exact location on the map above. 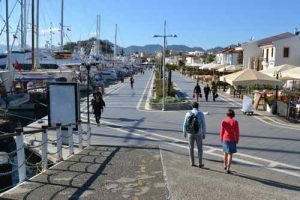 Walk from the cruise ship to Marmaris old town in about 15 minutes. Cruise ships dock at the Marmaris cruise terminal. The Marmaris cruise terminal is equipped with a tourist information desk and a duty free shop. In front of this building you will find a taxi rank and ATM machine. The walk from the Marmaris cruise terminal to the city center is about 1,5 / > 1 mile. It will take you approximately 20 minutes to walk. Simply walk from the cruise dock to the cruise terminal, turn left and walk along the waterline, past the marina, to the city centre. Along the way you will have the opportunity to go yacht watching or enjoy some fancy shopping. Most cruise ships offer a cruise shuttle into town. The ride goes all around the town and therefore takes approximately 15 minutes. 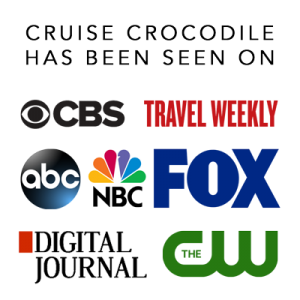 Ask for details at the front office on board your ship. There is a Sixt car rental service close to the Marmaris cruise port. There is also a car rental service directly at the cruise terminal. Find it’s exact location on the map above. The official currency is the Turkish Lira, but many place accept euro’s. 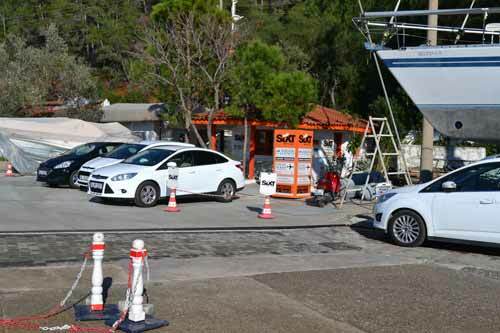 There is an ATM at the Marmaris cruise terminal should you need Lira. This is the cruise dock of Marmaris. Cruise ships dock here when a they make Marmaris their port of call. The cruise dock has several facilities for cruise passengers. 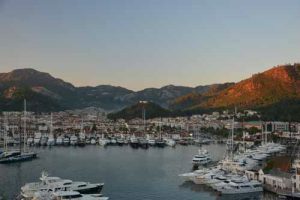 Read the full Marmaris cruise port guide for all the information.